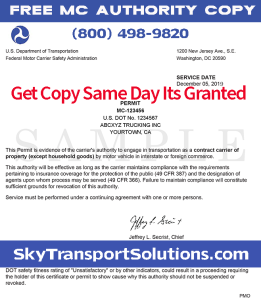 If you apply for interstate authority through SkyTransportSolutions.com, the MC Authority cost to get your operating authority is a one-time, flat fee that is lower than any competitor. Just call in: (800) 498-9820 and tell our staff what is the price to get an MC Authority form any company that has a website and a number that we can confirm the MC Authority cost. 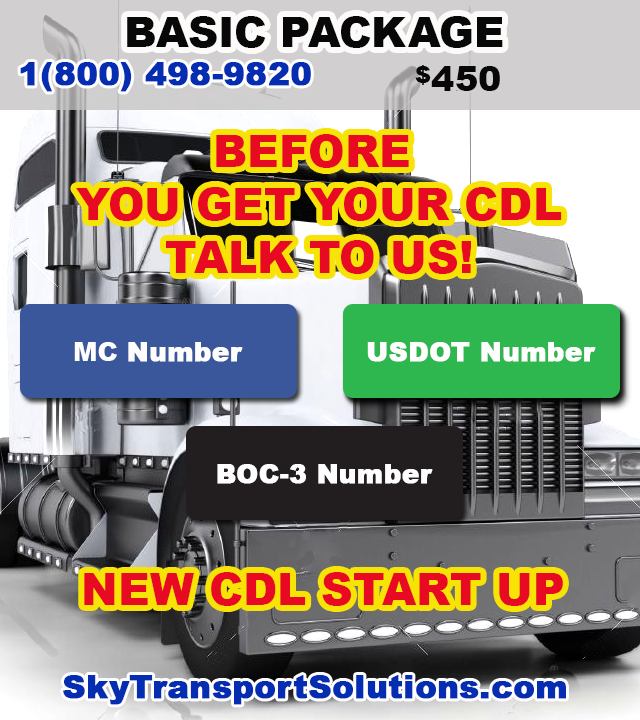 This is an all-inclusive rate that includes the federal filing fee, your USDOT registration number (in addition to your MC license number) and the process agent; everything you need to get your operating authority except insurance. There are no extra or hidden charges. Sky Transport Solutions has experienced staff who process all MC Authority applications. Beware, as some permit companies may offer you a low rate but then will add on additional charges for the process agent and your USDOT Registration filing. How Long Does the MC Auhtority Process Take? URS applications (new applicants only) may take 20-25 business days, unless they are subject to further review by the agency, in which case it could take an additional 8 weeks or longer. This delay is not caused by the processing at Sky Transport Solutions, but instead the FMCSA policy. (2) At any time after the expiration of the 10-day waiting period, applicants may consummate the transaction, subject to the subsequent approval of the application by the FMCSA, as described below. 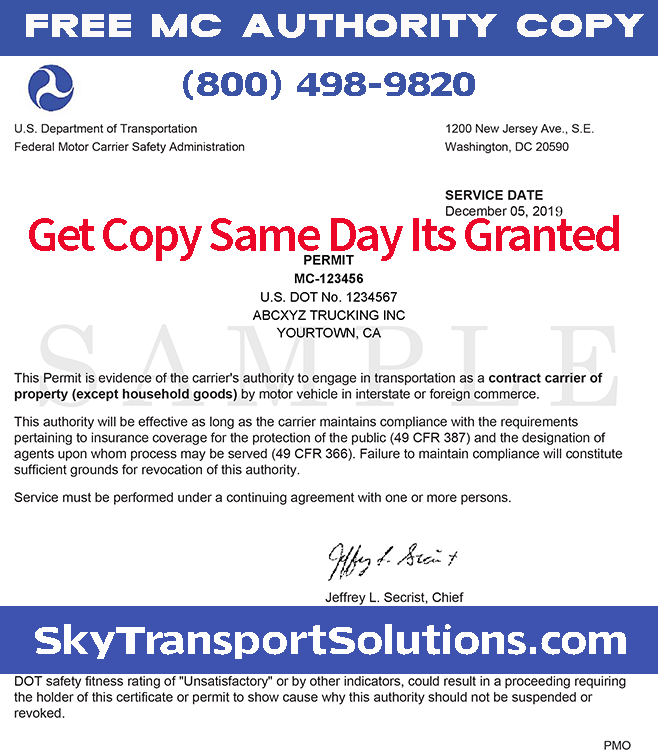 Sky Transport Solutions is warning that: motor carrier officials and new entrant applicants often receive confusing or misleading solicitations from service providers or third party administrators by telephone, e-mail, text and US Mail. These businesses are able to get your company’s information because when you submit an application or update your information with FMCSA, your basic carrier information is publicly available. Please contact our office if you are planning on getting your MC Authority. First-time applicants, who have never registered with FMCSA before and have not been issued a US DOT number, need to register via the new Unified Registration System (URS) as of December 12, 2015. Sky Transport Solutions has an expedited process for the URS. 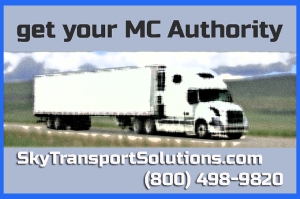 How do I check MC Authority for my truck as an owner operator? 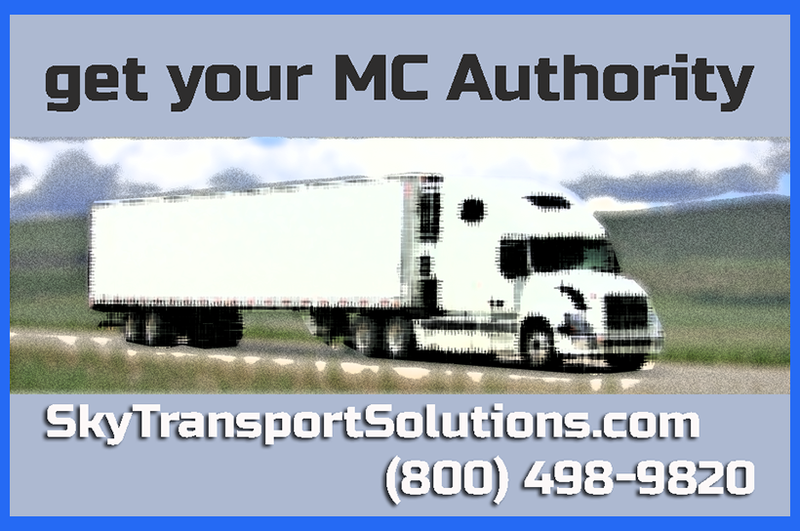 How do I check MC Authority for a trucking company that will ship my freight? These are common questions asked by shippers and truckers. The simplest answer is to use the link we will provide below. But first be aware of several facts. Generally the reason shippers will check on the status of the MC Authority is to make sure their freight is a truck and trailer that is legal on the road. This is important for the shipper because their freight may be held up at a roadside inspection point or at a weight station. In a much worse case scenario if the truck is involved in an accident there may be liabilities if the truck was not legal on the road. Sky Transport Solutions (STS) provides excellent MC Authority services. We can answer all your questions quickly and give you the information you need to run your truck legally on the road. We have provided great service over the years for thousands of trucking companies and owner operators. Generally opening a trucking company is not very complicated, but you can make mistakes if you have never opened a trucking company. Most trucking companies will start to get loads and freight once they have all their permits in place and are legal on the road and have the proper insurance for freight and the tractor trailer. Send us your Telephone Number and we will contact you and explain about USDOT Number and all our services. 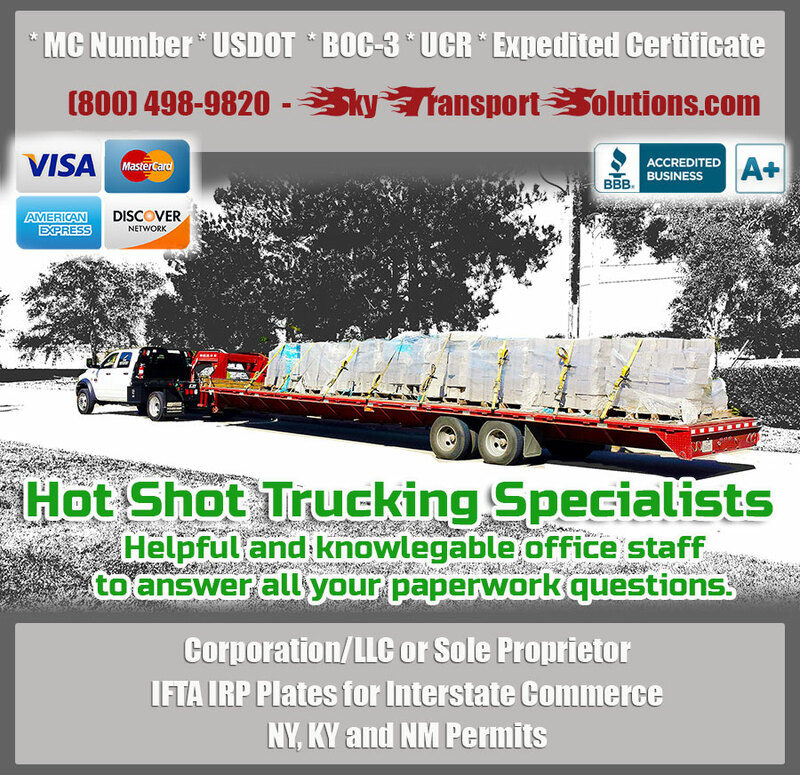 Send us your Telephone Number and we will contact you and explain about Hot Shot Trucking and all our services. hot shot trucking for jamaica ny. hot shot trucking knoxville tn. hot shot trucking texas city tx. The staff at Sky Transport Solutions (STS), is experienced at trucking, owner operator and transportation licensing, permits and compliance. The STS staff is eager to answer any of your questions and help ensure you’re ready to hit the road. Our industry expertise and dedication allows us to work quickly, and get you your Operating Authority (MC Number) faster than ever – within just 16-20 days. Plus we can get you a copy of your MC Authority the same day it is granted. 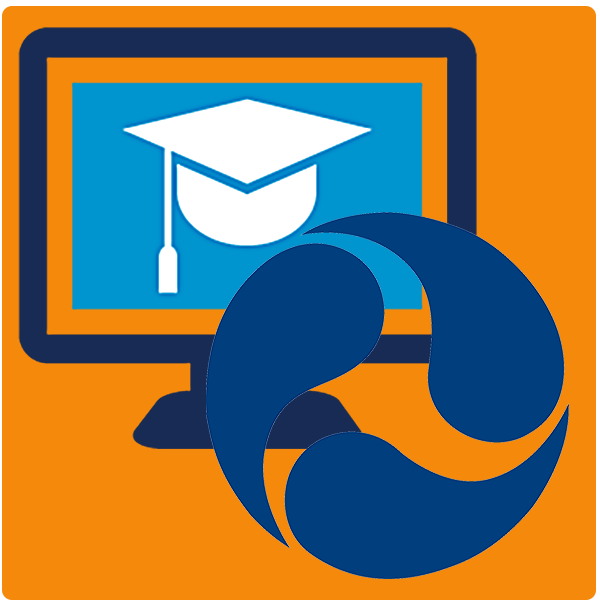 In addition we can provide our monitoring service for your MC Authority application once it has been filed. We work much faster than most other agencies – and we never skip steps or cut corners. We understand that you need your filings as soon as possible, and we prioritize reliability and efficiency in all we do. When you haul freight within a single state’s borders, you are operating as a INTRA-state Motor Carrier and required to obtain intrastate Operating Authority. Each state has different rules and regulations concerning Intrastate transportation. Furthermore, the agencies that govern Intrastate transportation vary from state to state. Fortunately, Sky Transport Solutions (STS) is aware of each state’s Intrastate Operating Authority requirements. STS staff will help you determine the proper Intrastate registration you must obtain. To request Sky Transport Solutions to assist you with your Intrastate Operating Authority, please submit the following or call us directly. Send us your Telephone Number and we will contact you and explain about MC Authority application process and all our services. The first step in your trucking career is to consider how you will learn to drive a truck or tractor trailer combination. If you know a trucker it is best to ask them about the lifestyle, type of work and the pay. It is important to remember that trucking may not be for everyone, as it is a demanding job. One important step in the beginning is to contact truck driving schools in your area and decide if you will want to peruse a trucking career. The process of MC Authority lookup is not very complicated at all. 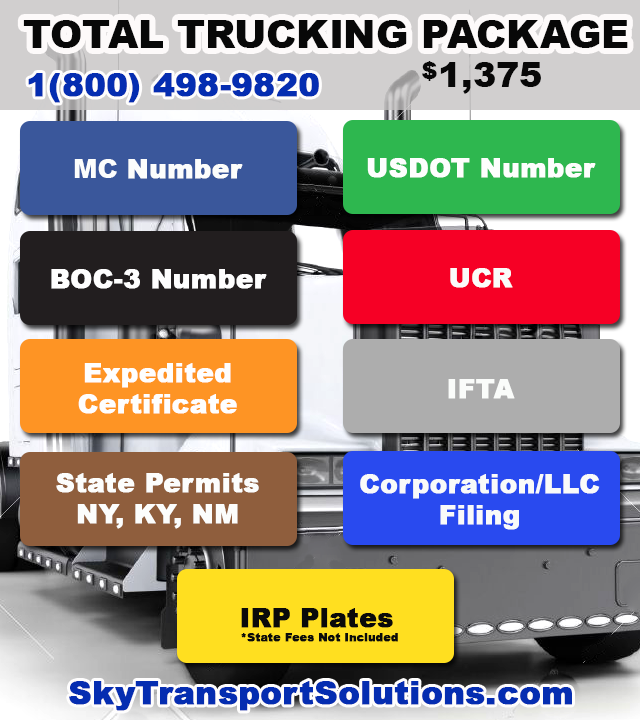 What you as the trucker or owner operator must know is the following information. You do not want want you to lose loads due to MC Authority Lookup, there is certain information that can affect the way a company thinking of giving you freight or loads can decide not to give your trucking company the freight. The Federal Motor Carrier Safety Administration is set to publish a proposed rule in the Federal Register next week that will allow it to suspend or revoke the authority of motor carriers who have been found to have a pattern of “egregious disregard” for federal safety rules, rather than relying on results of compliance reviews alone. Driver qualifications must be established. Truckers must be commercially licensed to carry property. Professional drivers should not have any medical condition or drug and alcohol involvement that may interfere with safe extensive driving. Driving limits are imposed. Basically, property-carrying drivers cannot work more than 11 hours following 10 consecutive hours off duty. Other bounds as to the working hours or weeks, breaks and off duty days are outlined by the FMCSA. There are specifications allowable for a vehicle to operate, such as its weight. Timely repairs and regular maintenance should be done by the carrier. Roadside emergency preparedness devices must be in place, as well. Like any regulatory body, the FMCSA imposes these rules aimed to uphold standards in the industry. With such initiatives, competence and safety for all involved are ensured. Not only are road users safe, but the carrier’s business operations are allowed to run smoothly as well. For new truck operators, it is advisable to seek full-service licensing consultants like Sky Transport Solutions (STS). They can guide you on how to apply for an MC number along with all the permits and information on legalities. Keeping your business safe and legal avoids costly penalties that are definitely detrimental to business profits. 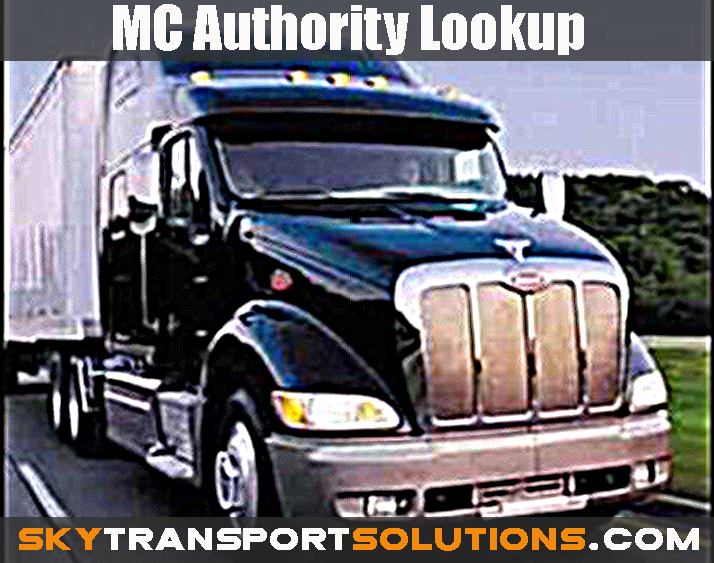 MC Authority Lookup is not a bad thing when your trucking company has a great record.